How to train a puppy to come! Today’s class is entitled “THE MOTIVATIONAL RECALL” or “how to teach a puppy to come.” The first step is area preparation. Then you must gather the proper equipment. Finally, an age appropriate method. I want to take this opportunity to express that this lesson is not only an Obedience behavior but a critical safety issue! The recall is the third echoing sound the puppy should learn. First, to start working on is his name. The second, is the sit and the third is come, and the formal command front. The safety issue, such as you are playing with your pup in the fenced in back yard and you realize the gate is open and a rabbit comes up under his feet and the pup is loose and headed for a busy street intent on catching his first rabbit. Can you call him back, could you save his life? This one situation can make all of your hours of training worthwhile! Also, a puppy that will come back when you call him will get more freedom. If he gets more freedom he is much less likely to bolt when he gets the chance. It works like this. He won’t come back because you won’t let him go. You won’t let him go because he won’t come back. You’re in a lose lose situation. Teach a proper recall and he will come back when you call him therefore you will give him more freedom and when he gets more freedom he’s going to come back. This a win win situation. Area preparation, equipment needed and age appropriate training method. Pick A place inside with very low or no outside distractions. Put the other dogs up or out, put the kids down for a nap, don’t answer the phone turn off the TV and radio and stereo. Ideally you should have an area where you can get 10 to 20 feet away from the puppy. Such as a cleaned-out garage, a spare basement room, a room with a long hallway or something to that effect. A high value treat, something the dog really loves, something special that he only gets during training sessions. I use the individually wrapped string cheese. The dogs love it, you can get 15 to 20 cut slices per stick so it is economical. 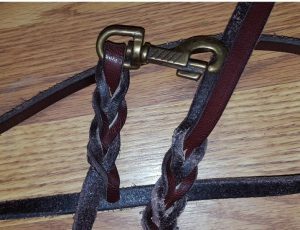 six-foot leather leash for working close up. This is going to be a piece of equipment that we will use throughout the dog’s entire life. So, get a good one! The leash you see here has a braided handle and bridal clip. It doesn’t have sewing, stitching or rivets. All of these things (sewing stitching and rivets) are signs of an inferior leash, this is where it will fail first. 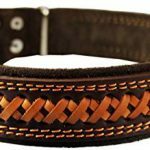 By hand braiding both ends of the leash you make it stronger than the body of the leash. A good heavy brass bridal clip is also a big plus on this leash! Over all a great value for a critical piece of equipment. A wide adjustable collar . This is another critical piece of equipment for the puppy. We want a wide, adjustable length, “because puppies grow so fast” with a substantial D ring to attach your leash to. 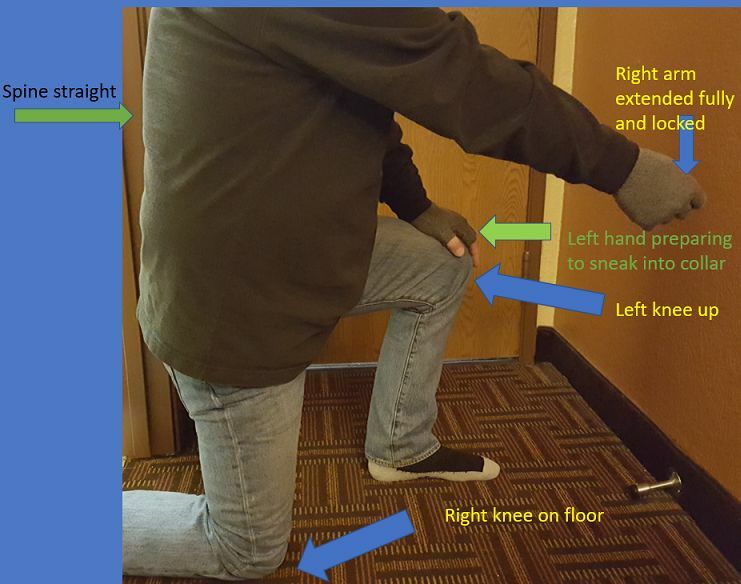 Measure carefully to ensure a proper fit. Keep in mind your puppy will grow rapidly and depending upon the breed of the puppy you will have to make allowances for growth. This is going to be a piece of equipment that we will use throughout the dogs entire life. So again, get a good one! A 30-foot by 5/8 long line. 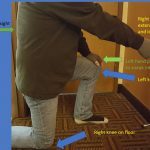 “>Click to view more.As we progress to a more advanced stage of recall training we will use a long line called a lunge line. We will need to add more distractions to test the reliability of this move. This is called, proofing. To proof this move, we will go outside first in an enclosed area. Then when he has proved reliable, one of the nice things about a 30-foot line is that you can catch him should he go astray. It also gives you the ability to make a correction at a much greater distance. Your final acquisition is the much-needed helper. With this final piece of the puzzle we are ready to lead into the age appropriate method we mentioned earlier. The motivational recall or how to train a puppy to come. The helper has a simple but critical task to perform in teaching your puppy the recall. 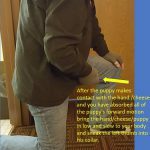 That task is simply to hold your puppy gently but firmly until he or she gets the proper signal from the owner/handler. At that point, the helper lets the puppy go and the helper’s task is completed. We are using the “puppy motivational recall” method. I am talking about a puppy 12 to 24 weeks of age who has name recognition and at least some idea of how to perform “the sit” command. 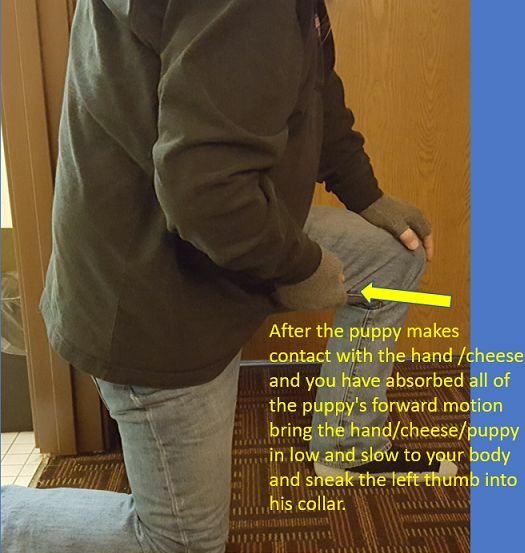 With a piece of cut cheese held firmly between the thumb and index finger of the right hand, the owner/handler will quickly touch the dogs nose with the piece of cheese and calmly walk to the other end of the training area. They will then turn with the right arm extended and do three things simultaneously. Number one, use the dog’s name, number two say the word come in a very positive but authoritative voice and number three you are going to “get small” by going to a position with your right knee on the ground. The left knee up, the spine straight and the right arm extended with a firm grip on the piece of cheese. As the handler’s right knee touches the ground the helper will release the puppy who will be quite eager to get to it’s owner/handler. As the puppy takes his very first step towards the owner/handler, the handler will praise immediately and intensely. This moment is what is called the primary point of praise or P.P.P. for short. We want to praise the puppy’s decision to come towards us. This is an absolutely critical moment. I believe in praising decisions and in praising behaviors with the emphasis on the decision to do the behavior. Decisions happen before behaviors. So, an excellent handler not only praises the behavior but praises the puppy’s decision to do the behavior. and over the dog’s head as in teaching the sit, as soon as he sits pop the treat in his mouth. Place a hand on each side of his face and compel him/her to look you in the eye for 2 to 3 seconds. This is exerting your social dominance and is a necessary part in building the problem solving framework. When the few seconds of social dominance have been accomplished very happily but gently pat, pop the dog on the side and say break. At this point I want you to completely disconnect from the puppy and walk away. If he follows you great, if he doesn’t that’s fine too. Whatever he does is okay. Let a little time go by, about one minute and repeat the procedure. That explains the physical end of the motivational recall. Now for the psychological or motivational part of the recall. What have we done so far? We have called the dog, praised the dog, taught the sit and control in approaching the handler. Then we exerted our social dominance. Upon the pup’s accepting our social dominance we released him excitedly and returned his freedom. As long as the dog associates the act of coming to you with the loss of his freedom your recall is not going to be reliable. When the puppy no longer associates the act of coming to you with the loss of his freedom, but instead he gets praise, food, and the return of his freedom then you have motivated your puppy to want to come when you call him! While on the subject of wanting to come when called, never call him out of a stay, don’t call him and give him a pill he doesn’t like, or a bath he hates. NEVER-NEVER call him and then get on his case! How to train a puppy to come means the recall MUST always be a positive experience. The recall, I don’t have a helper, to hold my dog. Is there another way of doing this without a helper? I would like to do it as often as I can. The method described in this class,”the motivational Recall”or, “How to train a puppy to come” requires a helper. Because of the very young age of the puppy, DO NOT Teach the stay and then use it to do a recall. You NEVER call a dog out of a stay only the “wait”. So what you need is to teach the wait game and that is a different class, that is coming soon. So check back often as there is always something new going on here at nudogk-9.com.